In the Project Options dialog, in the left sidebar, under HTML Export, select HTML Includes. Click the Add button to add the Toggle script. In the HTML Include window, in the Include box, select Folder. In the Folder box, click the “…” button and locate the Toggle script folder on your computer. 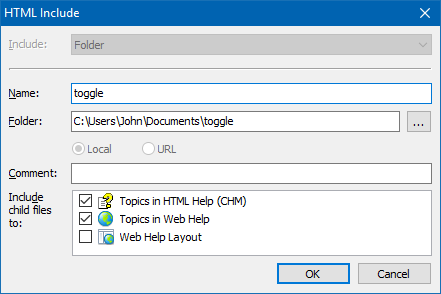 In the “Include Child Files To” box, check the options “Topics in HTML Help (CHM)” and “Topics in Web Help”. In the word processor, select the paragraphs that should work as an expanding section. On the View tab, click HTML Attributes to show the “HTML Attributes” pane. 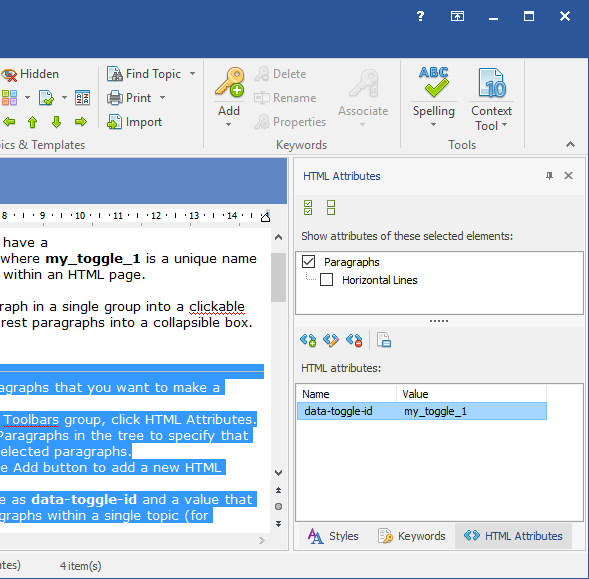 In the HTML Attributes pane, in the top list, check “Paragraphs” to view/edit the attributes of the selected paragraphs. In the HTML Attributes pane, in the bottom list, click Add. In the HTML Attribute dialog, specify the attribute Name as “data-toggle-id”. Also, specify the attribute value that will identify the specific expanding section within the help topic (for example, “my_toggle_1”). Remark: Please note that the first paragraph in the group will work as a clickable title, and the rest paragraphs will be turned into an expanding section. You can find a demo Web Help system that implements expanding sections by using our Toggle script here. It should be pointed out that the Toggle script also allows you to hide unwanted paragraphs within an expanding section, and also to add a Show All/Hide All hyperlink. 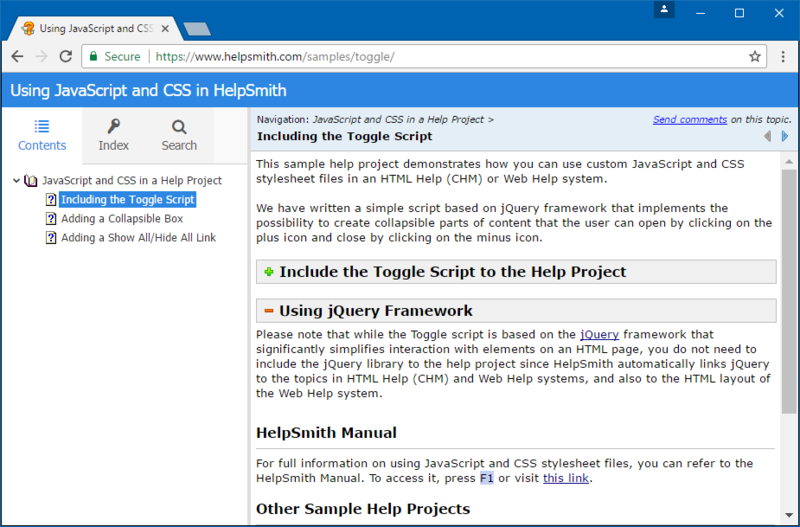 You can find the details on this functionality in the appropriate sample help project available on the Start Page in HelpSmith. Thus, you can access the files of the Toggle script by using your preferred file manager, or by clicking the Edit button available in the Project Options dialog in HelpSmith directly.